Published Aug 7, 2014 by Peachpit Press. Part of the Learn by Video series. Learn to use Bohemian Coding’s Sketch 3 for all of your interface design work with this 2-hour comprehensive beginner’s guide to the app that more and more interface designers are choosing as an alternative to Photoshop. In this 2-hour video tutorial, you get a complete introduction to using this lean, yet powerful new program. Amar Sagoo, a senior interaction designer at Google and avid Sketch user, starts by walking you through the Sketch interface and explaining the tools and what they do. 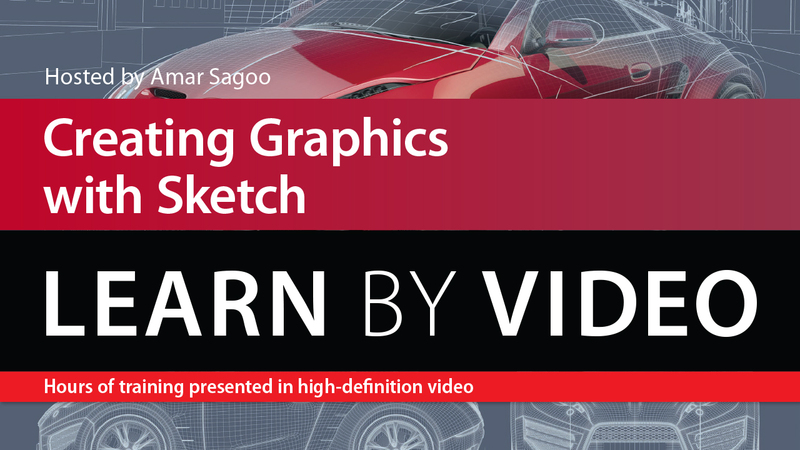 He goes on to show you how to set up and organize your projects; position, size, and style your graphics; create shapes; import work; edit bitmaps; export graphics; and more. You can download project files to follow along with the exercises and reinforce what you’ve learned. Even if you have no prior experience designing with Sketch, after working through this step-by-step video tutorial, you will have the skills and confidence you need to use Sketch 3 for creating all of your online graphics. The video is wrapped in a unique interface that allows you to jump to any topic and also bookmark individual sections for later review. The unique “Watch and Work” mode shrinks the video into a small window to allow you to work alongside in Sketch 3 as you view the video. Project files used in the lessons are included on the disc so you can practice what you’ve learned. At the end of every lesson, you can test your knowledge by taking interactive quizzes. This is an online video (streaming only) product and is not available to download.